Seven’s new gameshow The Wall will go head to head with Nine’s new Family Food Fight, at 7:30pm Monday October 30. TEN has another All Star Family Feud edition. 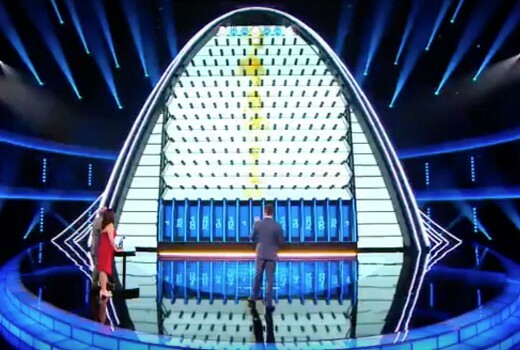 The gameshow, hosted by Axle Whitehead, sees contestant competing for “game-changing” amounts of money with giant balls dropped into cash zones on a four-storey money board. The Endemol Shine Production was filmed in Poland, one of the few territories where a set has been constructed. Seven will follow the show with UK drama Liar. A second Wall episode airs 7:30 Tuesday. giant balls and Axle Whitehead in the same press release – haven’t heard that since the ARIAs !! … sorry I couldn’t help myself! Not something I would normally watch but I’ve really gone off 7 of late because of their grey’s anatomy delay. I would have applied to be on the show had I known it included a free trip to Poland! Have watched the US version. The first episode gets you hooked, by episode 3, you’re sick of back stories, padding and drawn out. The format doesn’t allow you to walk away with the full “millions” it promises. Expect huge ratings for this however! I was hooked from the first episode, and have watched every episode after that. However, I agree that some parts of it are drawn out. I understand why they do it though, because there’s too much content for a half hour show, but just enough for an hour. I’m worried the Australian version might draw it out even more. Getting more than $1 million is rare, but I hope it happens on the Australian version!